Like the rest of the webBikeWorld evaluators, I’m a believer in continuously working to improve my motorcycling skills. This means taking everything from MSF courses to privately run advanced motorcycle riding courses to track days. And, of course, lots of practice, self-analysis and self-criticism. In the winter, the training routine means reading and re-reading books about motorcycle riding skills. It also means watching motorcycle training videos (although there are surprisingly few good motorcycle riding skill teaching videos). I even includes thinking about proper motorcycle lines through turns when I’m driving my car. There are always a few new nuggets that can be pulled from each book and it’s also good to reinforce forgotten tips. Some of the books have become classics and have stayed on the motorcycle riding skills “best sellers” lists for years. The best? David Hough’s “Proficient Motorcycling” (review). I think we have another classic in the making with Ken Condon’s new book, “Riding in the Zone”. There are many things I like about this book, not the least of which is the content, of course. I’m sure many webBikeWorld readers are familiar with Condon’s writing. He took over the enormous task of producing each month’s “Proficient Motorcycling” column from “The Master”, David Hough, in the Motorcycle Consumer News print magazine. In fact, Hough wrote a wonderful intro to Riding in the Zone, which details the interesting story of how he met Condon, mentored him and eventually turned over the keys. I’ll be honest; I didn’t even realize Hough was no longer writing the article until I read about it in Condon’s book — the handoff was that seamless! The format of this book and Condon’s Zen-inspired writing style really make a difference. He first explains what you’ll learn in each section, then he teaches it in clear, easy-to-understand language that’s neither condescending or over-simplified, yet each word and sentence has been chosen with obvious care. The sentences are so tightly constructed that I suggest reading very slowly to absorb all the information that Condon is conveying in each paragraph. It’s not that the book is difficult to read, or too technical. It’s refreshing actually — Condon left out the fluff that many authors fall prey to, if only to pump up the word count. There’s not a lot of fluff in this book, but it’s never boring. Because each sentence is loaded with content and meaning, it’s important to read it slowly, understand and absorb the meaning. For me, this style is perfect: clear, concise and right to the point. The icing on the cake is the last paragraph of each topic, which effectively summarizes what you’ve just learned. This is also key, and it follows the classic “introduce the topic, teach the topic and then summarize what you just taught” strategy that works so well to drive home the points. Now this all may seem logical, easy and simple…but it isn’t. Most readers will probably not realize that the information is being presented in this manner, and that’s the magic. There are a few other things that make this book easy to digest and understand. It’s very nicely printed on high-quality stock; it has lots of good color illustrations; and — thank you Whitehorse Press — the font is actually readable! Physical Skill Development, which covers topics like braking, cornering and positioning. Each of these sections have been carefully chosen to address issues faced by a majority of motorcyclists. I agree with the format and I can highly recommend this book for new riders who have taken some basic training and are just starting to get over the initial fear factor. But it’s also valid for motorcyclists with maybe 2-3 years’ experience who may be starting to harden some of their bad habits (and may not know it). In fact, Condon recommends the book in the introduction for the “early intermediate to early advanced rider who has a desire to ride with greater confidence”. 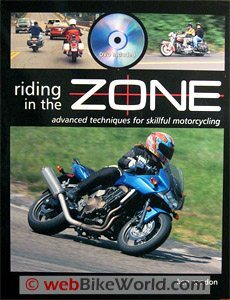 The “Riding in the Zone” title builds on the confidence issue. The “zone” is achievable when the rider feels “self-assured, confident and comfortable” — that is, when you are “one” with your motorcycle. I think confidence — but not over-confidence — is a very important factor in motorcycle riding. Confidence comes from skill development and risk management, and confidence helps make the sport fun. I often wonder why there are so many low mileage, 1-2 year old bikes for sale in the used motorcycle ads in the local newspapers. I wonder how many of these owners had unrealistic fantasies about motorcycling and never acquired the proper skill set and may have scared themselves silly after a few rides. And — thankfully for all of us — they finally decided that discretion is the better part of valor and put their new rides up for sale. I also wonder how many of them would have continued on past the danger stage if only they had taken a training course or two and perhaps read a book like Riding in the Zone. From “B.S.” (March 2009): “Bought the book and was so disappointed. Just brief sections failing to go into any depth on any one section. From “J.S.” (March 2009): “I may just buy Condon’s book, mainly because of your thoughtful review. Your concise and easily read review shows you value the well-written — whether doing it or reading it. With the tsunami of biker- and bike-related writing on the market I’ve become numb to the flotsam and jetsam and haven’t really considered anything since “Zen…” and the Roadcraft stuff from GB. That may change. Thanks! My occasional attempts at teaching were always based on the “Tell ’em what you’re gonna tell ’em…(etc. )” structure and it’s good to see you and Mr. Condon value that approach as well. It’s simplified, but it works providing you know your beans. And your thoughts on why there are so many barely used mounts on the market jibe with my own. While selling I found that if people had been better counseled and hadn’t gone for eye (and ear) candy they just might still be enjoying the ride. Editor’s Reply: Our DVD does not play on our computer for some reason, so I can’t comment on it.